Rabbi Mark al-Fassi of Paris, France will be officiating on both occasions at "Chaar Hachamayim" Synagogue on Cairo's Adly Street. the Meyr Biton Synagogue in Maadi is open on Yom Kippur. It is with great sorrow that we learned of the passing away of Cyril Lenos the husband of Mireille Lenos and brother in law of Raymond Stambouli. Mireille tells me he died peacefully. This is just how Cyril deserved to die, the perfect gentleman, so handsome and aristocratic: The young man who lived on the 6th floor of my building, who nodded nicely when he happened to pass us by, Mireille and myself, and we could only smile shily and gape at this handsome adolescent. Later, he married Mireille.They remained married for half a century. How time goes by... I can only reminisce how he taught us to drive, how he helped me at work when I needed it, and how he and Mireille remained my best friends, helpful and sincere, across the years, across the seas that separated us when they left Egypt. But, even after the years of absence, they still chose to come back to Egypt.To Sharm, to Sinai, to Luxor and Aswan, and of course to Cairo. Like a magnet Egypt called them back again and again. "I shall come back as long as I can travel" he told us. But Luxor was his farewell station. He died in France where they lived for many years, their second home. But there is no finish. Love never ends.We get used to people being dead, but we never forget. How can we? They have been part of our lives, for so long that,our lives and theirs have become intricably entertwined. They die, Raymond, Cyril, my mother and all the rest and some particle in us dies away with them. But we still remain, and as long as we live, they live too ... alive in our memory. To Mireille, To Dominique his only daughter and Fred her husband, to Megan, his grand-daughter, Bassatine News present their sincere condolences. Cyril, our good friend, rest in peace. Since time immemorial, the members of the Jewish Community, even when they numbered thousands, then hundreds, then less, have always celebrated Pessah in the privacy of their homes. 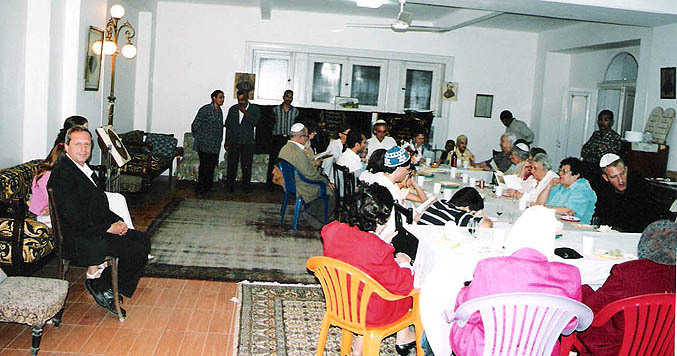 When Peace with Israel was established, the Israeli Embassy would hold a Seder in one of the posh hotels, then in a large tent in the Residence Garden, to which all the members of the Cairo Jewish Community would be invited. However for the past 3 years, due to rigid Israeli security measures, Israelis in Cairo celebrated the Seder in their homes. Likewise, members of the Cairo Jewish Community as best they could celebrated it alone. This was'nt much of a seder, as of times past. This year the outlook seemed to follow the same pattern till, lo and behold, as in fairy tales of yore, I received a phone call from Paris "I am a Hazan and I wish to come and partake in the Cairo Jewish Community Seder." You could have knocked me out with even lighter than a feather. How tell this good Samaritan that we had no intention of having a seder. As the thought for excuses went on drilling inside my mind, I suddenly woke up to an obvious solution. 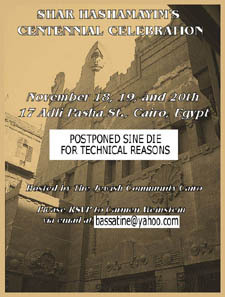 Why not organise, we the Community members, a seder and invite to join us anyone visiting Cairo at this time. Sooner said than done... not very easily or very smoothly... but really and truly done. Members of the Community were asked to come on Saturday 23 April at 06.00 pm at the Shaar Hachamayim Synagogue's reception rooms to celebrate the Passover Seder. April 21, the Hazan, Marc Elfassy duly arrived from Paris. "Whatever gave you the idea?" I asked him credulously. "I'm on Sabbatical and all of a sudden I thought, I must go and help these helpless women of the Cairo Community to celebrate the Seder!" came the reply. I prepared food for 25 persons thinking it would be more than enough. Yet as we were carrying on the prayers, more and more people presented themselves at the Synagogue door, asking to be admitted. We ended up about 35 and if the food was not plentiful, the cheerful spirits made up for it. Now I realise, it is the first time in the Egyptian Jewish Community (to my knowledge), that a communal seder has been celebrated. Thank you Marc Elfassy who did it all out of a brotherly spirit and without any material intent. Thank you all of you who came in true spirit to join us so that we are not alone and they are not alone. For us, feelings of friendly and warm presences mean more than just across-the-net greetings, no matter how sincere. We hope on every holiday to share more attendance. A Happy Passover to one and all. Senator Smith discussed similarities between the exodus of Moses and the Jews across the desert of Sinai, and that of Joseph Smith and the Mormons across America's desert. He pointed out that this had been prophesied in the book of Ezekiel. It appears the Mormons hold a record of all the peregrinations of the Jews across Eastern Europe. This parallel in our histories is undoubtedly why the Mormons are so interested in Jewish History. Although the visit was sheduled to be brief it nevertheless lasted a full hour such was the interest in our mutual history. On Friday 18 March, the JCC received the visit of the AJC group (The American Jewish Committee) who were on an official visit to Cairo to meet with President Mubarak and other senior dignitaries. They expressed the wish to visit Shaar Hachamayim and meet with members of the Community. As the hour was propitious for lunch 01:30, we decided to ask them to a lunch buffet. At the appointed time we received the visit of 20 AJC members led by their president Mr Robert Goodkind and Mr Jason Isaacson who had first contacted us. 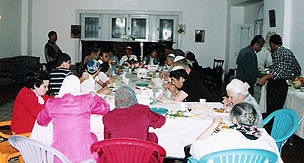 Carmen Weinstein briefed them on the history of the Jews in Egypt in the early 20th century and the consequences that led to the building of Shaar Hachamayim. As it happens Shaar Hachamayim Synagogue is celebrating this year its centenary :1905-2005. After a visit to the adjoining library, lunch was served in the synagogue's reception rooms: Shish Tawook, Kofta and all the usual Egyptian salads. Egyptian sweets included konafa and bassboussa. The group were delighted and declared it was the best meal they had had since they left home. Time allowing we all went to visit Ben Ezra Synagogue which drew their admiration being the oldest synagogue on earth and kept in such a perfect state. It was restaurated in 1992 by the Canadian Architecture Center under its president Dr Phyllis Lambert. The group left us to continue their periple assuring us it was one of the most interesting visits in their program.We received their comments on their return to the USA. EGYPT TODAY, Egypt's oldest English-language monthly dedicated its May 2005 cover story "Those Who Remain" to Egypt's Jews. It also features an exclusive interview with JCC president Carmen Weinstein. Unfortunately mag's cover photo is mistakenly attributed to Youssef Aslan Cattaui Pasha whereas man in local garb is in fact his grandfather Yacoub Cattaui. Tsk tsk... photo editor did not do his/her homework!!! Mohammed A. Aboulghar MD recently released a book in Arabic entitled Yahud Masr--Egypt's Jews From Prosperity to Dispersion, where he walks us through the history of Jews in modern Egypt mentioning several Jewish personalities who played a role in public life. He quotes very generously from Joel Benin's admirable work The Dispersion of Egyptian Jewery as well as from other recent sources including Bassatine News, which he extols and commends as a good peruse. 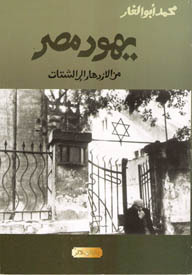 Abulghar also gives an account of a handful of interviews conducted in Egypt and abroad with present and former Egyptian Jews. As one reads these dialogues he wishes they were longer--they do not exceed a page each. In comparison with other post-1950 works on the same subject, Abulghar's is void of stereotype, half-truths and implicit disinformation. The book has no index but includes a bibliography. Henceforth Sukkot celebrations will benefit from a large gazebo erected in the garden of Maadi's Meyer Biton Temple. All the remains to complete this newest addition to the ongoing restoration work is a lick of white paint. The temple's basement meanwhile has finally been emptied of all the unwanted odds and ends accumulated over the last 50 years. Asked about secterianism, in the last installment of a three-part interview broadcast on national television on Tuesday 26 April 2005, President Mubarak, who has ruled Egypt for 24 years stated that as far as he was concerned "Moslem, Copt and Jew are one and the same--they are all citizens of this country with no difference between them."